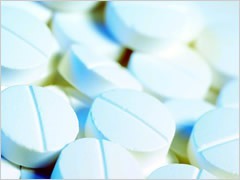 A pharmaceutical manufacturer approached Lucideon (then Ceram) to investigate the problem of yellow discolouration of white drug tablets upon light exposure. Lucideon's experts used ToF-SIMS (Time-of-Flight Secondary Ion Mass Spectrometry) to analyse the tablets. The data showed that selective degradation of the drug molecule had taken place where an acetic acid group was converted to an aldehyde group (mass difference = 30) . This resulted in the formation of a new molecule (Mdeg) with a mass of 30 less than the pristine molecule (Mdrug) where M = molecular mass. Conjugation of this aldehyde group with an aromatic ring resulted in a shift in the light absorption from the ultraviolet region of the electromagnetic spectrum into, at least partially, the blue region of the visible spectrum, resulting in the yellow discolouration. Thanks to Lucideon's analytical expertise and capabilities, the client was able to find out why the white drug tablets were showing a yellow discolouration upon light exposure and take steps to remedy the situation.